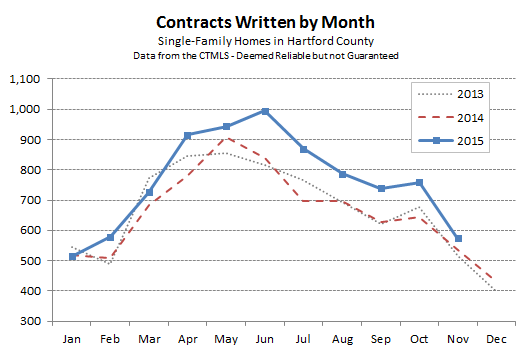 February 2016 strongly outperformed 2015 in terms of Hartford County single-family contracts. There was a 24% jump in activity versus the prior year, putting the year-to-date tally at nearly 22% ahead of 2015. Last month we noted that the mild January weather may have played a role in the real estate market’s strong start. Cold weather arrived almost immediately after we pushed published that story, yet the lower temperatures did not discourage buyers. Pleasant weather is never going to hurt the real estate market, but it doesn’t seem to be driving it either. Just about all the price points we track have experienced gains in contract activity in 2016. The one exception is the set of properties with asking prices of less than $100,000. There have been 2% fewer contracts on those homes. During 2015, 60% of the homes that went under contract with an asking price of less than $100,000 were bank-owned. The decrease in contracts for properties in this price band could be a sign that the price floor on bank-owned homes is rising. As we begin to get into the traditional spring market, we’ll start to look more carefully at the upper price points. The data we have so far is promising, but the raw number of deals is still too small to draw any strong conclusions. Hopefully sellers at the upper price points will have a better experience in 2016. It’s a balmy 50 degree day as I report on the January contracts. The weather so far in 2016 has not followed traditional winter patterns. One meager snow storm so far, with about 3 inches of snow at our house. It really hasn’t been that cold either. The real estate market seems to be taking its cues from the weather. 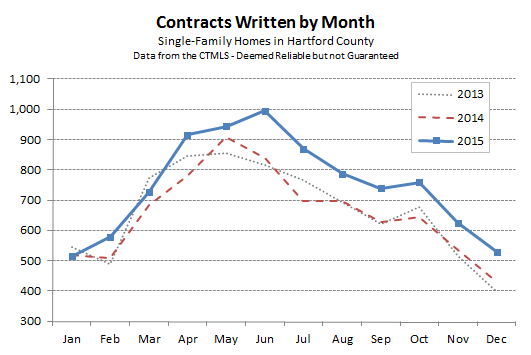 There were 611 single-family contracts in Hartford County in January, an 18% increase over last January. If the weather continues to trend on the warm and dry side, then we may be in for an early and active spring real estate season. Activity has been distributed over all the price bands in a reasonable manner. There are not obvious gaps in the market where buyers and sellers are out of sync. Inventory metrics continue to show more supply at the higher price points, though the overall average is a modest 4.0 months of homes available for sale. More and more homes will come onto the market each month, building inventory totals until buyer activity eventually catches up with sellers in the late spring. Individual towns showed a lot of variation in activity, as usual. Manchester got off to a strong start. Its 45 contracts is well above their typical January total, and continues a strong run from the end of 2015. 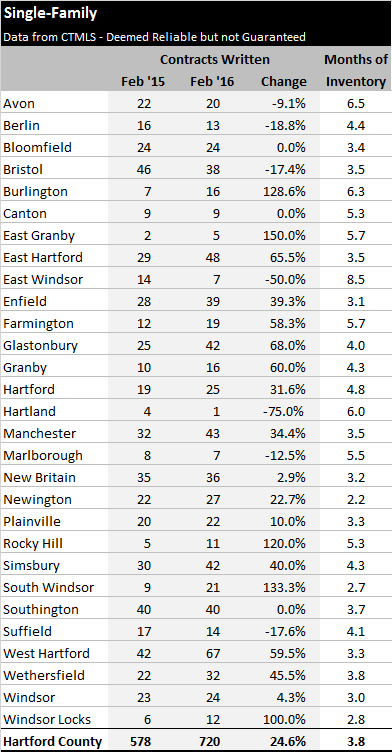 Simsbury’s 32 deals is perhaps even more surprising since it is basically equal to the April and May totals from 2015. No towns had an especially bad month, so we’ll keep our fingers crossed that January is a sign that 2016 will be an active real estate year. 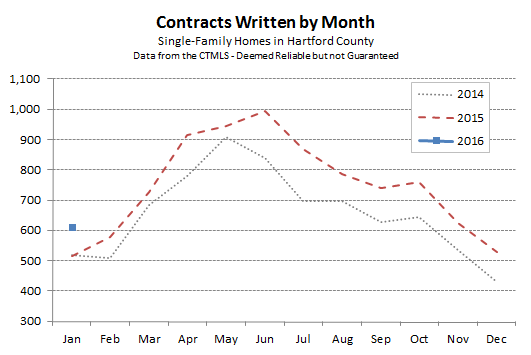 The Hartford County single-family market finished December with 529 contracts, an increase of 23% over the 429 observed in December of 2014. For the full year there were 8.980 total contracts, which was an increase of 14% over 2014. The above chart shows that 2015 outperformed every month of 2014 except January. In general, the first quarter got off to a bit of a slow start because of the regular snow storms. The weather was more favorable to the real estate market at the end of the year. November and December were especially mild, and although things did slow down a bit in the final months of the year, both were much busier than previous years. We will publish a more detailed full year review in the coming week(s) based on 2015 closed sales. Year end is the one time when we think it is useful to use data to look at pricing trends. Since that’s the main question people ask us, it will be nice to have some recent data to supplement our anecdotal feel for the market. Inventory is down right now due to sellers pulling their homes off the market for the holidays. However, we expect things to pick up quickly since we’re seeing a surprising amount of activity from both buyers and sellers. Seems like people are interested in real estate at the moment, so the markets may get an early start if the weather cooperates. Tonight Kyle was looking through the MLS and discovered that another agent is using one of our property photos for their listing. He knew this because it’s a rare listing photo that he took on his own. We hire professional photographers for all of our listings, but in this case it was a rainy day, so he had to retake the exterior photo of the condo building on a sunny day. This agent’s exterior picture has the same exact people and cars in it (on a busy Downtown Hartford street) that our picture has, so it’s clearly been copied. The agent never asked for our permission to use it. He just took it and went with it. Our only knowledge of it came from scanning the MLS for other information and stumbling across it. The agent has been using this photo for months. Most troubling about this is that it’s now the THIRD time we’ve caught agents using our photographs and/or floor plans without our knowledge or permission. It always happens with condo listings because they have the same exterior shots, amenities and sometimes floor plans. About two years ago I found that a very well-known agent took a floor plan from one of our listings and used it on her own with the same layout. I called her to have a chat about it, she blamed it on her assistant and I insisted that it be removed immediately from all real estate websites or I would report her. I know her assistant and know that she wouldn’t have done it because she knows better, so the agent had done this on her own. I was fairly furious about it. A little over a month ago we found another agent using all of our exterior and amenity photos on one of their listings. I called her broker and he was mortified and said that she knew better. The main issue here is that all of these agents do know better. They know they are supposed to use their own work. Or at least ask permission if they can use a photo. Our MLS does not allow taking other agent’s photos and reusing them without permission. We have sold listing photos to agents in the past when a listing is transferred to them when we were not able to sell it, or given them a photo if they just want an exterior shot. Do you know what they had to do to get that from us? Ask us. That’s all. A courtesy phone call or email. That’s all it takes. But instead these yahoos use our work, that takes time and money to develop, because it’s professional looking and they don’t have the time, effort or money to do it on their own. It’s infuriating. We could report the agents to the MLS or another real estate authority, but that creates an issue when you need to do transactions with these agents. You can’t have people hating you because they think you were mean to them. So we deal with it on our own. I just wish folks were professional enough to have the courtesy to ask to use things that are not their own. We don’t seem to be there yet with all agents. 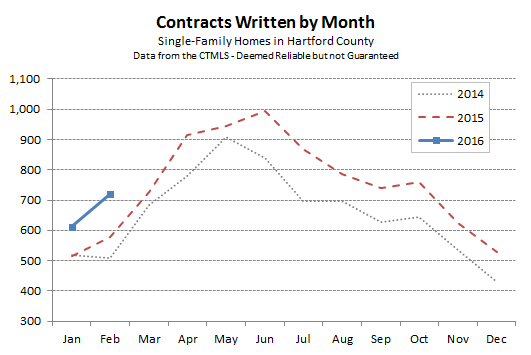 The Hartford County single-family real estate market finished November with 574 contracts. The total was 7% higher than November 2014, and was 13% ahead of 2014 on a year-to-date basis. Trends that we have discussed throughout the year continued to hold. Activity grew more strongly at the lower price points, and the inventory of available homes increased as the price point increased. The only price band that experienced fewer deals than in 2014 (on a year-to-date basis) was the $1,000,000+ band, which dropped from 49 contracts to 40 contracts. We have reached the time of the year when most of the buyers that are out looking for real estate are serious about finding a new place to live. December shoppers are often relocating to the area for jobs, or are making other important life changes. We are seeing both in the market right now. The unseasonably warm weather should help extend the real estate market further into December. 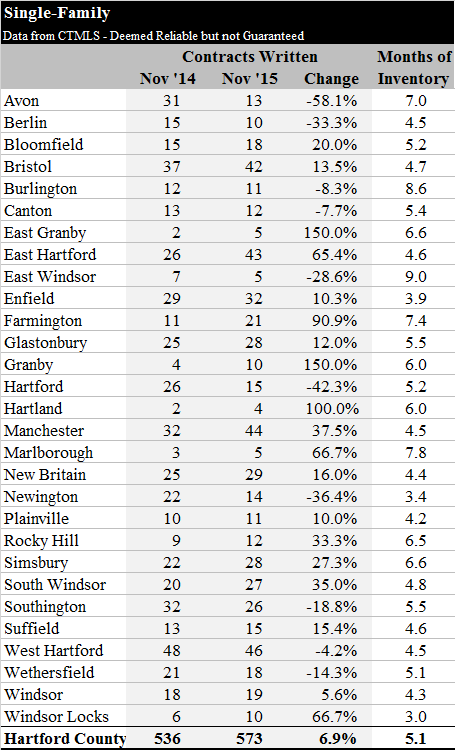 Sellers have been less inclined to pull their homes off the market than in past years when there was already snow on the ground. And casual buyers might be willing to continue their search for another couple weeks since it’s still actually nice to go outside. We will take advantage of the opportunity to hopefully sell some more homes before calling it a year. Happy holidays everyone, enjoy the season!